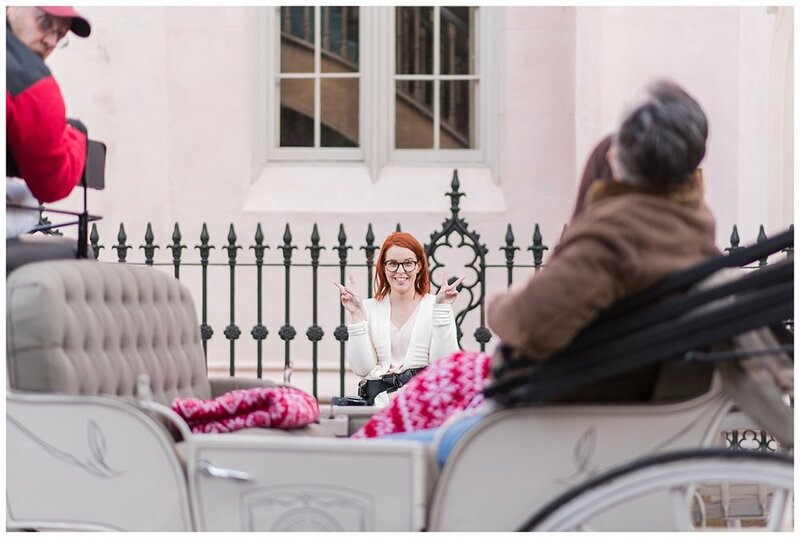 You may have seen that Caity of Cait Kramer Photography and I went to Charleston a few weeks ago! We have shared a few pretty pictures from our weekend in the gorgeous charm-filled city but as I was attempting to pull together a really beautiful, inspiring blog post... I couldn't get past all of the bloopers. Oh goodness there are so many bloopers. 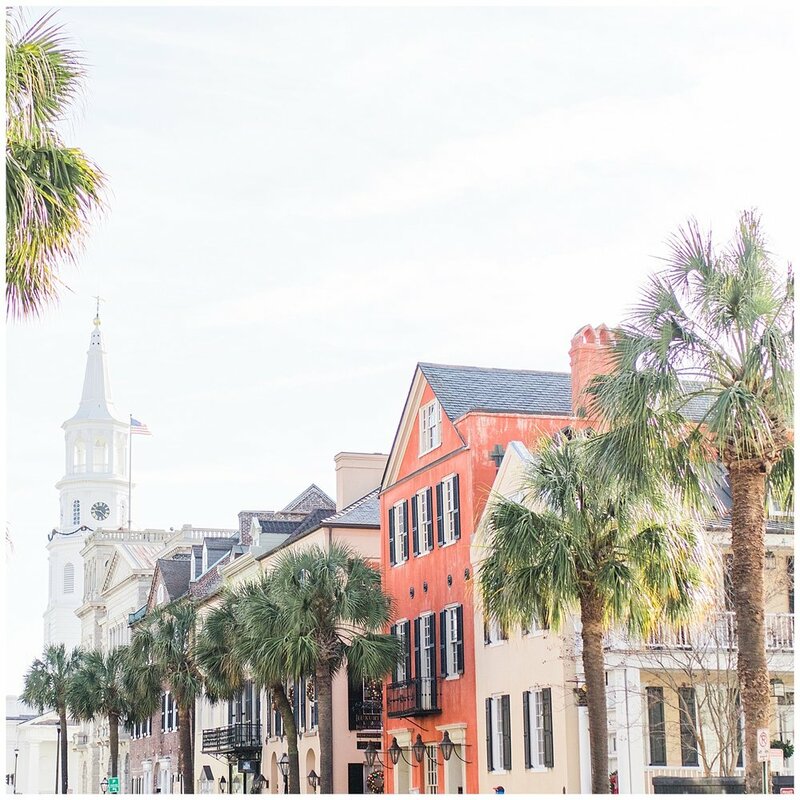 In Charleston, Caity and I took a lot of time to commiserate with each other about all of the things about our industry that can make you feel burnt out, frustrated or just totally baffled. But then we drowned those feelings in tacos, margaritas, beautiful window boxes and 20+ miles of walking. We left totally renewed and excited for all that 2018 holds. I drove while Caity edited 4+ engagement sessions under her homemade dark room (aka a black vest). When we finally got to Charleston, check in at our hotel wasn't until 4 PM but the amazing (and I mean truly she was an angel) receptionist checked us into a ready room at 10:30 AM and we couldn't be more grateful. THANK YOU SO MUCH Hampton Inn Historic Charleston! We took the most restful, renewing, needed nap before trekking out to find some food. Poogans Smokehouse (and the sweet server who tolerated our exhausted rambling)... you're a trip-saver. Our burgers, cocktails and sides were fantastic. I could have eaten an embarrassing amount of that potato salad. SPOTTED! My Nicole Miller wedding dress in a window while wandering! With burgers, buttery potato rolls and a sufficient amount of vodka in our systems we started our 20+ miles of wandering all around Charleston. Even the bike shares are cuter in Charleston. We did an excessive amount of Insta-storying. If ya'll watched, thanks and my apologies. We really enjoyed the College of Charleston's campus and Caity was particularly impressed by their water bottle refilling stations. There was a lot of cuteness... and prettiness... and "why aren't the houses in the North East this colorful!?!". ... our personal coolness went really down hill after that. The beauty of the city started to really distract us. But... we also really started to blend in with the locals! Poor Caity. I don't know how she was so comfortable walking around in public with my weirdness for a whole weekend. Time out... gotta pull up my pants. 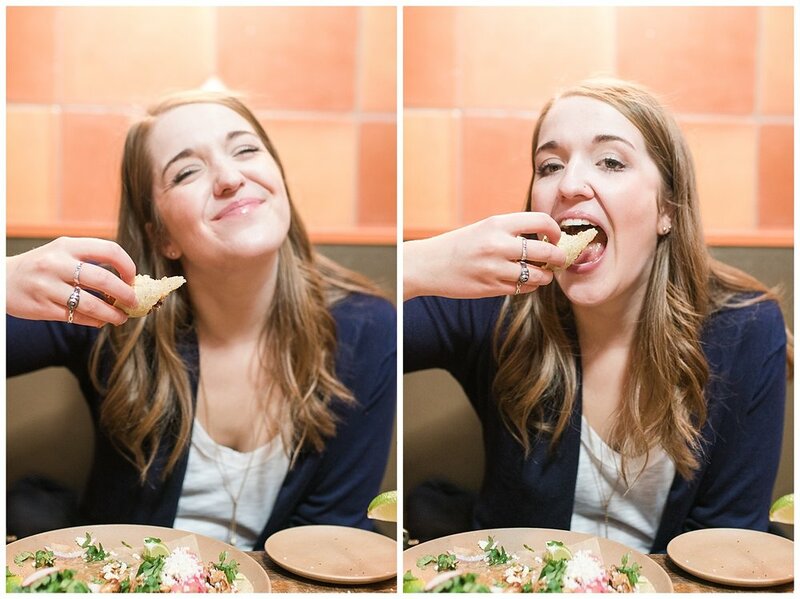 Minero refuelled us with the most killer tacos and margs. In all seriousness, GO EAT AT MINERO. On Saturday evening we met up with our giveaway winners, Amanda and Wes for their downtown session (which I promise I will blog eventually). A&W, thank you so much for your hospitality and for saving us a long cold walk after our session. Love you long time. Shout out to this lady and her vacuum who photobombed quite a number of times. You're the real MVP. Caity is a really good bag lady. Her skills include carrying all of the things, deciding which way the sun is moving and looking cute while holding 40 lbs of stuff. We ran into a bachelorette scavenger hunt who needed their bride to take a picture with love birds! Hi girls! Hope you had a wonderful time! 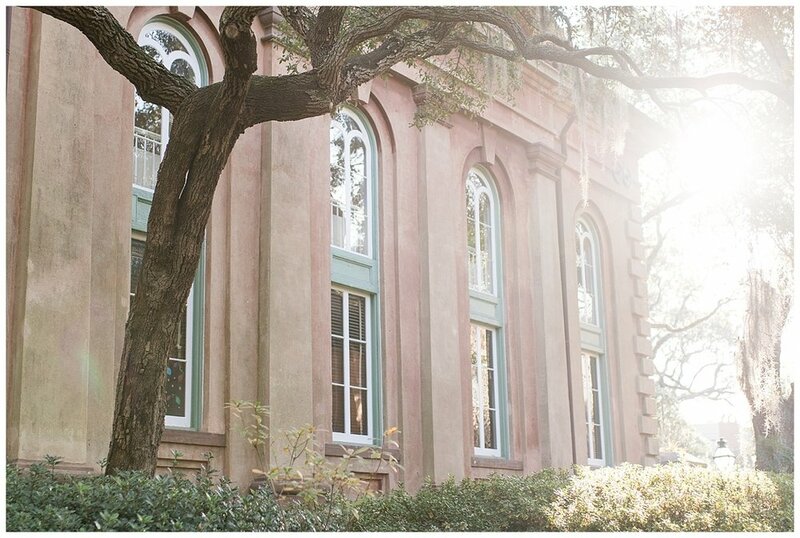 "... and if you look to your right you'll see the pink French Huguenot Church here at 136 Church Street. Built in 1844, the congregation it serves traces its origins to the 1680s and it is the only continually operating independent Huguenot church in the U.S. that has services every week. You'll also see this random red head who won't move." God, I am so pretty. Time out... gotta pull up my pants... again. This is a series I like to call... "We're photographers, not models - dammit." On Sunday, before embarking on the long drive home, we visited Magnolia Plantation and Gardens where we met some furry friends and Caity debuted her Costco pants. I tried to be friends with this goat but he wasn't into it. His loss. 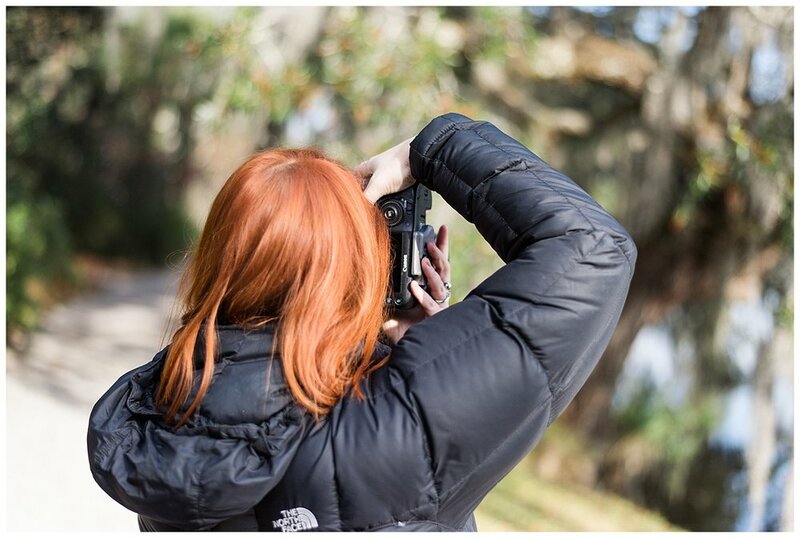 There's actually a lot of really pretty portraiture and epic shots of the historic plantation that I'll share later but for now you're getting a beautiful view of us in sweatpants and Uggs. You're welcome. Ok, look. I can try to be pretty and normal but it's only going to last three seconds so hurry up and snap quickly. Hang on, I need to yawn. ARE YOU TAKING MY PICTURE? Oh halp. I'll get you back for that. That time I had a brief love affair with a Live Oak on a riverbank. Sigh. Ah... what city will we take over next year and can we take our friends along? It was three days of constant laughter, 40,000 steps and reminders of what's good in life. 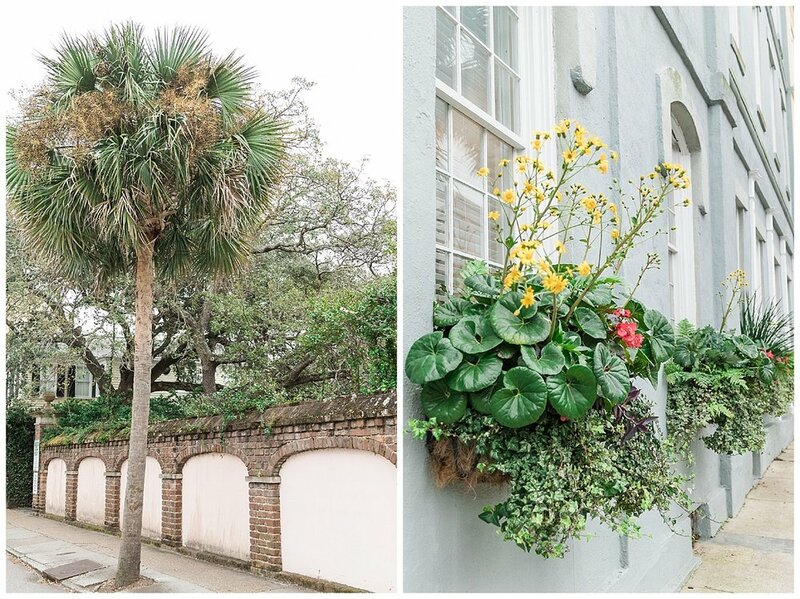 More Charleston blog posts to come soon with less of our ridiculous faces! Happy 2018, ya'll! Some of these images were taken by Cait Kramer Photography and edited by yours truly.